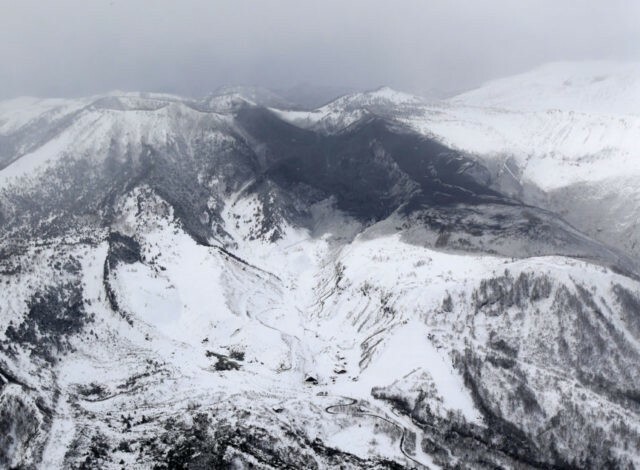 TOKYO (AP) — A volcanic eruption Tuesday injured at least nine people at a ski resort in central Japan, officials said. One or two of the injured were on a gondola when the window was shattered by volcanic rocks, and the others were believed to have been hit by rocks while on the slopes, said Makoto Shinohara, an official in Kusatsu town. Five people had broken bones, but none of the injuries were life-threatening. The Japanese military said six soldiers who were among about 30 on ski training were buried by an avalanche, but they had all been pulled out of the snow. The Japan Meteorological Agency said Mount Kusatsu-Shirane erupted around 10 a.m.